Waves of vibrant colours, cool design and earnest music are washing over me, in a sea of memories, all invoking the creativity, angst and hope that accompanied the rupture of the social fabric during 1960s America. Everything from recollections by those participants in the March on Washington as its 50th anniversary approaches this week to the soundtrack of 3 days of “peace, love and music” – otherwise known as Woodstock, 44 years ago this summer. And it has got me thinking not just about the relationship between music, photography and memory, but also about documenting the past. In other words, why history matters, who is “telling it” and how we share these life experiences. When I think about history, it is not just about focusing on changes in large communities and nations, it is also about the subtle shifts in individual lives and ambitions. This is what I found in making my documentary about an unheralded photographer and the little known piece of 1960s cultural history she was part of. Stepping in front of the camera for Her Aim Is True, Jini Dellaccio did not mind reversing roles – documentarian turned documentary subject. From our earliest conversations, Dellaccio was keen to “pass on” how her life experiences and pursuit of creativity led her to an unusual and bold stint in early rock and roll photography. For me, Jini Dellaccio’s “history” provides perfect material for documentary filmmaking. To start with, Jini’s past and her unique perspective is not going to be found in textbooks and as I discovered, is mostly hidden from the mainstream and is under the radar (like much of women’s experiences in recorded history). It still astounds me to think about Dellaccio’s path from playing jazz saxophone in the 1930s to her unlikely role in rock and roll photography three decades later. Hopefully, weaving a personal story like Dellaccio’s of trailblazing creativity in male dominated professions, broadens our exposure to the past, and helps debunk the myth that history is just a bunch of dates, monarchs, battles. There is so much to discover elsewhere; missing pieces from the official records, forgotten stories full of countless “anonymous” players and influencers who have failed to make the cut in history lessons. But there is something else going on when we start integrating personal histories into our consciousness about the past. My experience of making Her Aim Is True certainly made me question where all this cool history I knew nothing about before leads and can inspire. And I think it relates to McCullough’s definition of history quoted above. In sharing how creativity shaped the US, historian David McCullough has written of presidents like Washington, bridges like Brooklyn, and as seen in a recent 60 Minutes profile, cares deeply about making sure the next generation is not historically illiterate. For him and for many of us passionate about history, it does really all start with the stories we tell – around the dinner table, over the campfire and among our friends, long before we get to the milestones in history regurgitated in the classroom or on television news. 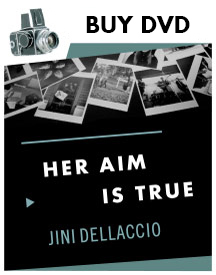 Hopefully through constant searching for that original source, (in music, photography or written word) and revealing life experiences like Jini Dellaccio’s we can forever forge a deep connection to the past and link with what we value in our present lives. Somewhere between immersing myself in Jini’s artistry and recollections, and turning Jini’s narrative into a film – I found a piece of missing history that I want to share with audiences, and I think it matters. There is no doubt that in divulging the story behind her quiet role as a pioneer in rock photography during the mid 1960s (and the life events that led her to be hanging out with garage rockers less than half her age) Jini Dellaccio is giving us so much more to explore. Within this unusual account of a so far under-exposed life in art, we are glimpsing seminal moments in cultural history and meeting the participants in a gritty music subculture through her lens. I personally connected with Jini Dellaccio as a great storyteller as well as a remarkable artist. I think there are storytellers in every family, everywhere, all with important tales to tell – about choices we make, how we live our lives and respond to events. In making a film like mine, it helps to be passionate about arts, cultural history, music and seeking out an eclectic bunch of characters to build a narrative that draws your audience back to a time and place you want them to inhabit with you for the course of the film. There are no gimmicks or special effects here. In disseminating history like this, I am just sharing a slice of life that I think is valuable in the broader context of true stories, and the art of passing them on.